My car was totaled in a car accident. Will they pay for my rental? I hit someone while they were jaywalking. Am I responsible for their injuries? 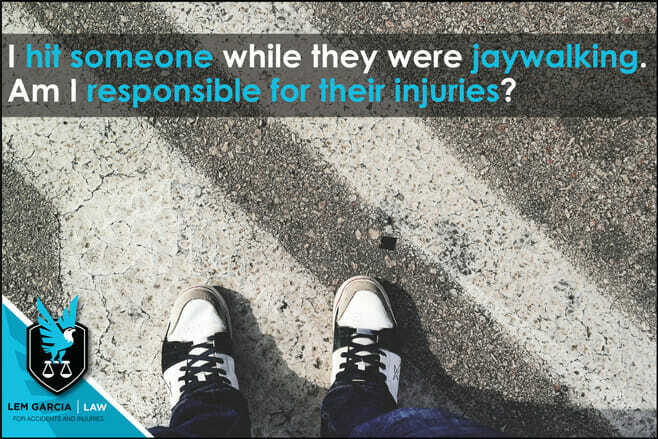 If you hit a pedestrian who is jaywalking, you may be held liable for their bodily injury claim. Their bodily injury claim includes payment for their present and future medical bills, pain and suffering, mental anguish, and lost wages. As a driver of an automobile, you always have a duty to drive reasonably, prudently and to watch for condition on the road. Furthermore, as the driver of an automobile, you must drive in a manner not to endanger the safety of any person or property. As a result, even if a pedestrian is breaking the law by jaywalking, you can be at fault for hitting that person crossing the street. This is why it is always important to focus on the road ahead of you and watch out for pedestrians, especially when you are in a residential area or near a school. If you see pedestrians walking on the sidewalk, on the street, or going to their car, don’t assume that they will not walk onto the street. People are not always paying attention to cars on the roadway and sometimes walk onto the street even though there is a speeding car coming their way. There are many instances where people were texting, talking on the phone, or were distracted in some other form and walked out onto the street and got hit by a car. If this is the situation, the pedestrian is largely at fault, but the driver is also at fault if there was an opportunity to avoid the crash, but did not take advantage of it because he or she was also negligent. If you were hit as a pedestrian while you were jaywalking, you still may have a case against the driver of the car that hit you. If the driver could have avoided the crash, the driver should have avoided the crash. Unfortunately, too many people – drivers and pedestrian alike – are not paying to where they are going. If this sounds like you, call West Covina car accident lawyer, Lem Garcia, for a free consultation. We will let you know if you have a case we can help pursue for you or not.